Europa Nostra, the leading heritage organisation in Europe, and the European Investment Bank Institute today published a technical and financial report for the rehabilitation of the Constanța Casino in Romania, listed among the 7 Most Endangered heritage sites in Europe in 2018, following a nomination made by the ARCHÉ Association. Built in 1910, the Constanța Casino has become a landmark of the Black Sea shore. Daniel Renard, the Swiss Romanian architect who designed the building, opted for a lavish expression of Art Nouveau to reflect Romania’s modernisation during the reign of Carol I. Following many years of alternating commercial and state held responsibility for the building’s care, the Casino has been abandoned since the 2000s. The technical and financial report was formulated on the basis of the outcomes of a four-day mission in Romania undertaken from 8-11 June 2018, during which representatives from Europa Nostra and the European Investment Bank Institute visited the Constanța Casino and met with local and regional stakeholders. This is an iconic building in a key location in the city and it certainly merits being restored to its former splendour to provide for social and community activities. This very worthwhile initiative is confirmed by the proposed Government support with the allocation of substantial funds for its rehabilitation (reportedly 12 million euro). 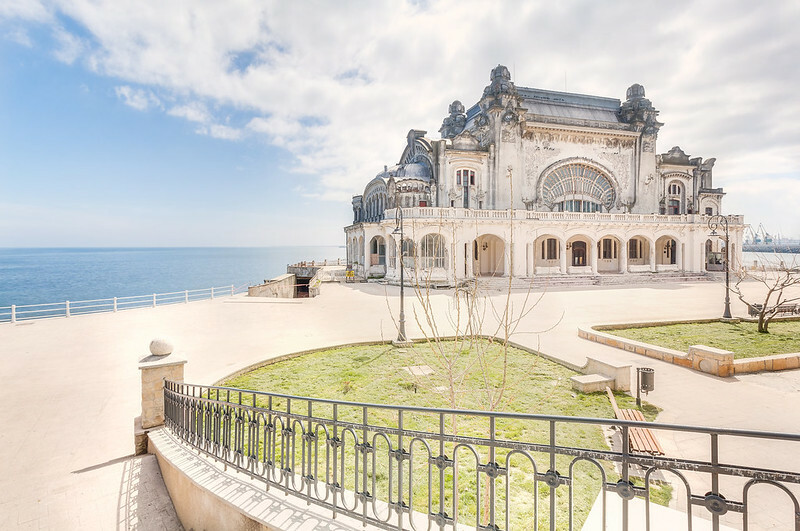 The owner and operator of the Casino, the Constanța City Hall (CCH), hands over construction and design responsibility to the National Investment Company (NIC) through an agreement valid until early 2019. • The existing state of the building, which has been abandoned for some years, is not well known in detail and only feasibility level studies have been undertaken so far. This lack of firm data makes the definition and cost of the repair works on the structure and the restoration of the decorations problematic. • The proposed usage seems not to have been studied in sufficient detail for firm long term credible decisions to be made on the design details of the new layouts and associated arrangements. • The new configuration and layout to provide added features and the necessary modernisation to current standards is still to be defined in detail. • The proposed strategy is to update the Feasibility Study in a limited exercise (budget €50,000) before final approvals and launching the construction tender. These weaknesses could be overcome by further detailed work prior to proceeding to the construction tender stage. • The main contract would be on a “design and build” basis, based on the tender documents prepared from the Feasibility Study and other preliminary studies. • The construction contract would be administered by the NIC with a normal site presence with some local support and this would be monitored from Bucharest. • The Owner (CCH) hands over responsibility to the NIC for the construction phase via a Concept Strategy Note and Design Brief and only becomes involved again at final handover. These arrangements – for the Contractor to take responsibility for the detailed design combined with an administrative approach to managing the main contract – are considered to be totally inappropriate in the circumstances and would create a high risk of failure in terms of quality, cost and timing. The lack of any direct Owner involvement at the construction stage is also to be regretted. • Extend beyond early 2019 and appropriately amend the agreement between CCH and MRDPA concerning the NIC management of the execution phase. • Recognise the complex nature of the restoration and modernisation of this building which requires enhanced preparatory work by experienced experts and overall strong management, much more than currently envisaged. • Complement the Feasibility Study with further investigations and a detailed design phase to cover notably the structure, the actual needs through a special study, the modernisation in terms of layout, equipment and facilities, and the repair/adaptation of the special features. • Prepare the tender and the scope and specification of the works so as to have a traditional “construction only” contract, or contracts. This or these should be refined to allow flexibility to account for the nature of the works and for potential changes during the works. The contract(s) should be firmly managed, probably by experienced independent Consultants, under the aegis of the NIC. • A coordinating Project Implementation Unit (PIU) or equivalent should be set up under the aegis of the MRDPA to have overall control of the project’s progress as soon as possible. It could be managed by external consultants with project management experience and comprise senior personnel of the NIC and the CCH and perhaps others. It is the key control and decision maker driving the project. • Establish within the CCH a Focal Point as soon as possible and a Casino Contact Group with senior CCH personnel to liaise with the PIU, to begin to prepare for the operational phase and to reach out to the public for ideas and support. Selected NGOs and members of the public should form part of this group, which should be relatively compact to be effective. • Implement the several recommendations and suggestions included in the text of this report (e.g. involving experts in the Art Nouveau restoration, seismic design checks, CCH to study further the usage so as to define the needs better, CCH to address and prepare for the operating phase, CCH to be aware and prepare for the maintenance responsibility, the need to prepare for increased funding for cost overruns and higher consulting fees). • Proceed as soon as possible with the Emergency Works under CCH’s responsibility to protect the Casino from further damage before starting works. • Undertake a review of the sea defences to provide long term stability for the sea wall and the foundation platform. Also, to consider improved protection by building a breakwater offshore to the east similar to that location to the south. The missions to the six other European heritage sites listed in 2018 will be held by the end of 2018 / beginning of 2019. The technical and financial reports will be released a couple of months after the missions.